Canada’s housing market has diverged in recent years: Vancouver and Toronto joined other international real estate markets such as New York, London, and Sydney, while prices in other major cities remain subdued. Vancouver and Toronto housing now costs double that of comparable homes in Ottawa, Montreal and Calgary as the two most expensive cities continue to experience the fastest increase in prices and pull further away from all other regions in the country. Let’s look at the changes in buyers, housing stock, and credit creation that are behind this tale of two markets. Unlike the US, Canada has no recent history of overbuilding. The ratio of housing starts to household formation is roughly in balance at 1.2 starts per formation, which has allowed Canadian construction to avoid the boom/bust cycle often associated with housing. Furthermore, stable housing supply reduces the risk to lenders and has encourages continued orderly expansion of the housing stock. 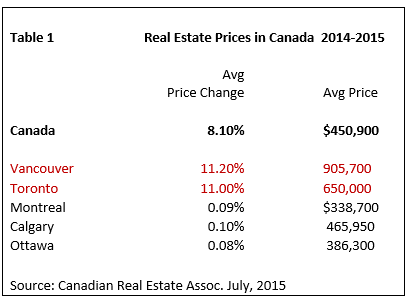 Since housing supply has not driven climbing prices in Vancouver and Toronto, we focus on housing demand below. Canada is a "young" country. The working population is one of the most important components of housing demand. Chart 1 compares the working age population (ages 15-64) as a percentage of total population. Canada’s working age population is nearly 69% of the total population and exceeds the ratio in the US and the average for all OECD countries. Furthermore, the population aged 25-34 is growing at a rate of 2% y/y ; the age group of 30-34 is growing at even a faster rate of 2.6% y/y. These groups underpin the market of first-time buyers 1. Immigration accounts for about 75% of the population growth in Canada . Over half of Canada’s 260,000 annual immigrants make their way to Vancouver and Toronto alone. Recent work by CIBC reveals that immigrants aged 25-45 years have dominated the estimated 770,000 non-permanent Canadian residents. Moreover, immigrants living in Canada for more than 10 years have a higher rate of home ownership than native Canadians, thereby exerting more demand pressure 2. 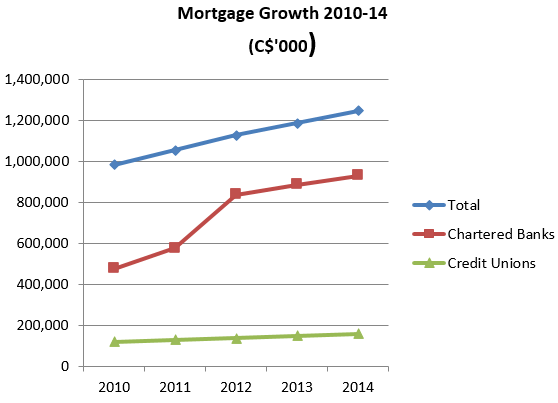 Total mortgage lending has increased by 30% since 2010, primarily attributable to commercial bank lending. In the past 6 months, the banks have eased off on this growth pattern, but levels remain relatively high. As non-bank funders also aggressively move into this market, both builders and buyers are finding easy financing. Credit growth has not been isolated to mortgages. Statistics Canada shows that household debt including mortgages, consumer credit, and non-mortgage loans reached 163 per cent of disposable income as of June 2015. The IMF warns that “although household debt levels appear to have stabilized recently, they have increased to historical highs in the past decade... one of the highest among countries of the OECD.” Just as easy credit allowed Canadian households to enter the housing market and push prices higher, there is now concern that high debt poses the risk of a major housing market correction. By way of comparison, US ratio of debt to real disposal income reached 172% in 2014. Canadians are less indebted than their American neighbours. Debt should always be measured against assets to get a measure of the degree of risk assumed (Table 3). In real terms, the growth of household debt did accelerate to an annual average rate of 5.3% in 2000-2011, compared to 3.1% , in the 1980s, and 3.7%, in the 1990s. However, the ratio of debt to assets has barely changed. In the 1980s it stood at 16% and now it averages 17.6%. Overall, the accumulation of household debt has kept in line with the growth of household wealth . 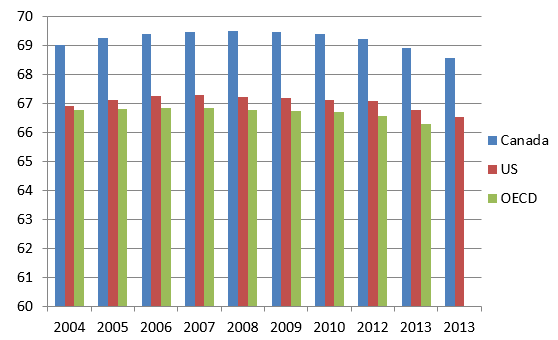 Put differently, Canadians have not increased their leverage from prior decades in any meaningful way. Finally, given that current interest rates are at a historical low, debt service is within a manageable range. And, with no anticipated interest rate increases, these debt levels do not pose a threat to the housing sector. Canada continues to benefit from inflows of international capital. Investors from Hong Kong and mainland China have been buying up real estate in Vancouver and Toronto, contributing to the bidding wars in both cities. While there are no official data documenting purchases by non-residents, realtors have provided statistics and anecdotal evidence to support this argument. We must caution the reader that much better data and greater research are needed before any conclusions can be reached regarding the role of Asian investors in influencing housing costs in Canada. The Bank recognized that, although its policy moves were necessary to stimulate overall growth, it runs the risk of further inflating Vancouver and Toronto housing markets. Is There is a Correction Coming? And, both cities face land scarcity, especially in the core areas. 1. Canada has a split housing market; Vancouver and Toronto, overwhelming skewed the average home price in the Canada; looking at the rest of Canada, prices are stable and values remain relatively low. 2. The growth in housing stock has risen to match the growth in population and household formations; there is a relatively good demand/supply balance in place. 3. 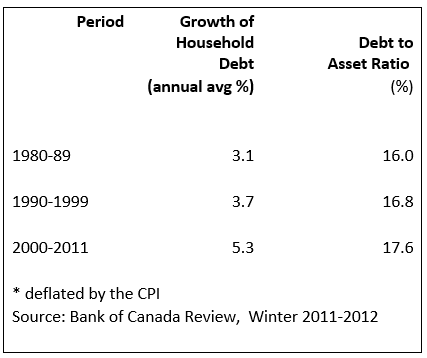 Household debt measured against the growth in assets indicates that the ratios today are within the historical averages. 4. There is concern, however, should the Canadian economy weaken further and employment and growth deteriorate that housing prices and values could be at risk.